Over the last three years, Doug Coby has collected plenty of accolades on the NASCAR Whelen Modified Tour. The four-time and defending series champion has won the last three championships, becoming the only driver in the modern era to accomplish the feat. And over that three-year stretch, Coby has used success at the 1.058-mile New Hampshire Motor Speedway to help him along. eastern_propaneoil_100In his career at the ‘Magic Mile’, Coby has four career wins in 27 starts, along with 11 top five finishes. His last 10 races there have seen him finish on the podium eight times, including his four career victories. In his last three races, Coby visited Victory Lane twice and finished third in the other. Luckily for Coby, he couldn’t be heading to a better track as he looks to gain ground in the championship standings. Tthe 37-year-old has finished inside the top-10 in just half of the races and enters NHMS sixth in the championship standings, 54 points from the top. As he looks to capture a record-breaking fourth straight title, collecting maximum points possible could be a must. The first of two races at the New Hampshire oval also comes with the first of two non-points races of the season on Friday afternoon. The 35-lap Whelen Engineering All-Star Shootout scheduled for 2 p.m. will include some of the top drivers of the unified tour looking to capture glory. The Whelen Modified Tour will be part of a tripleheader on Saturday, with the NASCAR XFINITY Series and NASCAR K&N Pro Series East also in action. The Race: The Whelen All-Star Shootout is a special non-points event. The Eastern Propane & Oil 100 will be the seventh of the 16 races on the 2017 NASCAR Whelen Modified Tour points schedule. It will be the first of the two stops at New Hampshire Motor Speedway this season. The Procedure: The starting field for Friday’s Whelen All-Star Shootout is limited to 20 cars: Past NASCAR Whelen Modified and Whelen Southern Modified champions, race winners from NWMT and NWSMT events prior, and 2016 NWMT and NWSMT Rookies of the Year. Once the above criteria has been met, if any of the starting positions remain available, NASCAR may allow additional teams based on number of seconds, thirds, so on in the NWMT and NWSMT from 2005 to present. A random draw will determine starting positions. Saturday’s 100 lapper is 36 cars, including provisionals. The first 32 cars will make the field through the qualifying process and there will also be four provisionals that could be awared through the provisional process. The race is scheduled for 100 laps (105.8 miles). The Track: This will be the 66th NASCAR Whelen Modified Tour race on the 1.058-mile oval, dating all the way back to the inaugural race in September 1980. The first ever race on the ‘Magic Mile’ saw Mike McLaughlin visit Victory Lane. The Whelen All-Star race has been held since 2014 and past winners include Bobby Santos (2016), Woody Pitkat (2015) and Ryan Newman (2014). No driver has swept both races on the weekend. Race Winners: in the 65 previous Whelen Modified Tour races at NHMS, 21 different drives have visited Victory Lane in the championship points events. Mike Stefanik leads all drivers with seven career modified wins at NHMS. Doug Coby and Justin Bonsignore split the tour races at the oval last season. Pole Winners: There have been 26 different drivers start from the top spot at New Hampshire. Last season, Ron Silk captured the pole in the July event, while Mother Nature rained out qualifying in September. Andy Seuss will also be a part of the event. Max Zachem will pilot the Mystic Missile for the shootout, while Monster Energy Cup Series regular Ryan Newman will also return to the series. Newman was the winner of the inaugural shootout in 2014. Silk Teams With Brady Bunch: Former Whelen Modified Tour champion Ron Silk will return to the series on Saturday after missing the last three races. After parting ways with Danny Watts, Silk had been looking for a ride until the Brady race team came to the front. Silk will wheel the iconic No. 00 at NHMS Saturday, a place he has been in Victory Lane at before. In his 26 career NHMS starts, Silk has two of his 10 career wins there. He also has finished inside the top five in his last four appearances at the New Hampshire oval. Suess Is Busy: Home-state hero Andy Seuss will be part of a tripleheader this weekend. The Hampstead, New Hampshire driver will compete in the Whelen All-Star Shootout on Friday before he competes in the 100 lap Nor’easter 100 for the Whelen Modified Tour early on Saturday. In the evening, Seuss will run the Ted Marsh owned No. 11 NASCAR K&N Pro Series East car as well. 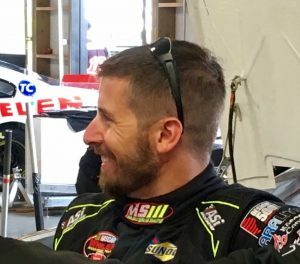 In 16 career NWMT starts at NHMS, Seuss has four top-10 finishes. Newman Is Back: Former Whelen Modified Tour winner and current Monster Energy NASCAR Cup Series driver Ryan Newman will return to his modified past on Saturday afternoon. The South Bend, Indiana driver has four career series wins in his 23 starts, including two at New Hampshire Motor Speedway. In the two races there last season, Newman finished fifth and has finished inside the top five in half of his NHMS starts. Close Finishes: The Whelen Modified Tour portion of the weekend has been known for some of the closest finishes in track history. In 2008, Chuck Hossfeld defeated Ted Christopher by just .001 seconds at the checkered flag. In this race last season, Doug Coby defeated Donny Lia by just 0.037 seconds. The NASCAR Whelen Modified Tour will be part of a tripleheader on Saturday at NHMS. The tour will be the first race of the day and will be followed by the NASCAR XFINITY Series. The final race of the day will be the NASCAR K&N Pro Series East. Friday, some of the Whelen Modified Tour drivers will also be part of the 35 lap Whelen All-Star Shootout, which begins at 2 p.m.
Why report the 2015 winners?